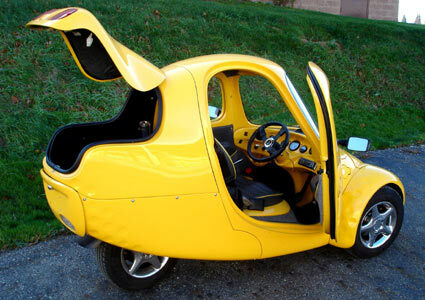 Go Green, Purchase Ugly NmG Electric Car | OhGizmo! Well, calling the NmG electric car from Myers Motors “ugly” might be a little harsh… How about: “donning progressive neo-urban aesthetics”? I completely made that up, and it probably means nothing, but it’s hard to hate on any kind of transportation that has zero emissions. Sure, the required 4 to 8 hour charge will only take you on a sucktastic 30 mile drive (though it tops a decent 70mph), but that should be plenty for anyone that uses their vehicle simply to commute. We suspect that if you’re willing to go through with plopping down a cool $25,000 for this one-seater, you’re also likely to turn a blind eye (and ear) to the stares and stifled giggles from your bemused co-workers. After all, you’re saving the environment, and they’ll rot in hell. That’s the old Corbin Sparrow…did a quick search and apparently they went belly up. Guess they sold them to MM. But if you look at this site they used to cost about $14k…talk about inflation in 7 years! Yup – it is the old Corbin Sparrow. My old roommate has a green one. Supprised to see them come back around again as if they were new. Sure Corbin went belly up.. anytime you sell something for 14 grand that costs 22 grand to build you’ll soon go bankrupt! While the NmG may look like a Sparrow all its major components have been upgraded and made more reliable.. I own one and love it and while you might think it ugly I’ll guarantee you that you could drive a Lamborghini and not get the attention or satisfaction that driving one of these babies will get you!! All of these small electric autos are nice but cost of production, distribution and adverticing outway the sale price. Perhaps a number of these autos could be introduced into a community for use by elderly, students or something. But it would need to be leased for a small fee until it catches on. Remember the electric car from Chevy, their mistake was not wider distribution in the US. Had Chevy done that you would see them still on the road and more in demand. I would like to see it in my hometown of Osceola Iowa.